In January 2014, a funny thing seems to have happened. Parts (though not all) of the econoblogosphere forgot why time series econometrics fell out of favor in the early 1990s when it comes to analyzing minimum wage policies. Besides the fact that there is a lot more variation in minimum wages than just the federal (or average) minimum wage in the U.S., the timing of the minimum wage increases is very uneven. For example, U.S. minimum wage increases tend to occur more frequently during the late phases of the business cycle (see Figure 4). Now this timing issue makes trouble even for state panel studies, but it really wreaks havoc on time series analysis. By not having a control group, time series evidence has to rely solely on changes in trends around the time of minimum wage increases, as this blog post by Kevin Erdmann most recently tries to do. In 6 out of the 7 episodes of minimum wages that he considers, employment trends slow down (or fall outright) following the minimum wage increases. In other words, the red post-MW trend lines have a smaller slope than the black pre-MW slopes. Well, here’s a reason why this evidence should be written off as a coincidence. Below, I overlay Erdmann’s graph with the NBER business cycle dates in light green. Why am I looking at this? Because if the post-MW period includes a recession and the pre-MW period does not, that will misattribute the recessionary job losses to minimum wages. I hand drew the recessions in, and I’m not known for my fine motor skills. But I think you get the gist from the picture above. In 5 of the 6 events, the “post periods” used to fit the post-MW red trend line appear to include a downturn. (In other words, the red trend lines and green shadings overlap.) Now, we know very well that teen employment falls during a downturn. 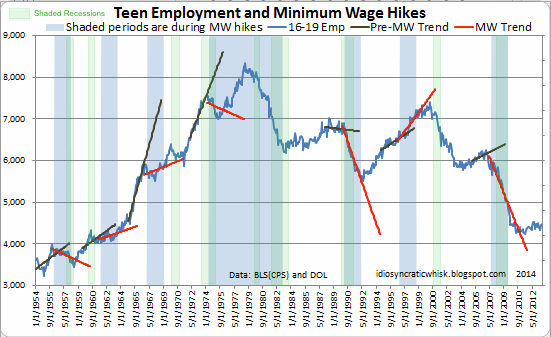 This tends to make the red post-MW trends smaller, providing a very simple explanation for why in 5 out of the 6 cases, the teen employment trend slowed down. And the 6th increase (in September 1961) happened right after the recession officially ended in February, so one could make an argument that the business cycle can help explain that one too. Oh, and that 1 episode where the trend line actually rose after the minimum wage increase – which doesn’t fit the job loss explanation? That would be the minimum wage increase in the late 1990s boom, where the post-MW period does not appear to include a recession. In other words, business cycles can explain the pattern of employment trend changes in at least 6 out of the 7 episodes, and maybe even partly in the 7th. Look – whether minimum wages cause teen employment to fall remains controversial. I think the clearest U.S. evidence comes from comparing across border counties with different minimum wages, using regional controls, or using synthetic control groups. All of these suggest the impact on teen employment is fairly small for the kind of minimum wage increases we have seen in this country. But whatever your position is on this question, you should probably steer clear of simple time series evidence that economists on both sides of the debate have wisely moved away from. I don’t expect this to be published in peer reviewed journals or anything. The reason I posted it was because I was surprised at how uniformly the trends shifted before MW hikes. I had the same thought as you about recessions, but upon further review, the signatures in the employment data that caused my original interest remain when the recession dates are carefully chosen. Oh, the other thing I thought was helpfully visualized here was that, since MW hikes tend to come in series, and since the trend change happens at the first hike, and then tends to recover soon after the last hike, statistical analysis that treats all the MW hikes as individual events is probably suspect. I doubt that it shows anything you didn’t already know, but I thought some people might consider these things to be interesting. It look like the decline from 2000-2004 was the only extended drop that was not directly overshadowed by a recession (even though it was preceded by one). And that period is FAR removed from any of the hikes listed. That’s weird how the picture of the book popped up there. I just left a link. Never saw that happen before. Is Amazon taking control of our computers?! Next they’ll be shipping us what they think we want to buy. 🙂 Strange.